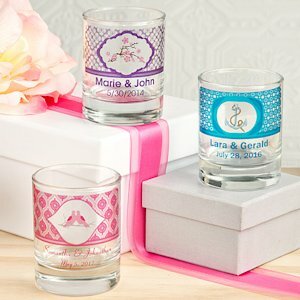 Send your guests home with a gift that will last with our Personalized Shot Glasses/Votive Candle Holders! Set them on your event tables as they are to be used as shot glasses or add a votive, candies, small favors and more. Their versatility makes them a favorite! The personalization includes many options like pattern, color and design choices along with the ability to add 2 full lines of your own text. Each glass measures 2.5" tall x 2" in diameter and holds up to 3.5 ounces. Some assembly required: Add the clear sticker (2.5" x 1.75") to the side of the glasses. Am I reading this right? The votive candel holder has a sticker applied to the votive/shot glass? If I order them with the box is the ribbon that is on top also included? Yes, the white bow is included in the add-on boxes as shown on our site.